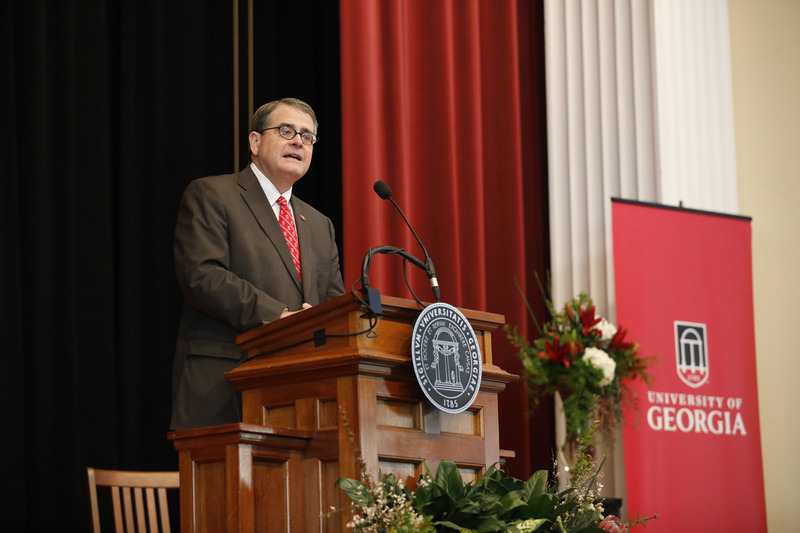 University of Georgia President Jere W. Morehead delivered his annual State of the University address Wednesday, highlighting record accomplishments from the past five years and unveiling a series of initiatives to elevate UGA to new heights of excellence. “If the last five years have shown us anything, it’s that when we commit—when we unite around a common purpose—there is no goal, no aspiration, beyond our reach,” Morehead said. Morehead underscored the surge in undergraduate applications and the increasing talent of incoming first-year students. The most recent class of first-year students enrolled with an average high school GPA of 4.0 and an average ACT score of 30. He also noted the institution’s rising undergraduate student completion rates—68 percent of students now finish in four years, and 86 percent finish in six years or less—as well as the fact that 96 percent of students are employed or enrolled in graduate school within six months after graduation. Some of the measures that have made this success possible include hiring efforts to reduce class sizes and strengthen academic advising and a pioneering experiential learning requirement to give students more opportunities to connect coursework to the world beyond the classroom. Morehead also praised the deep partnership between the university and its home state, pointing to a new estimate of the institution’s annual statewide economic impact, now valued at $6.3 billion. A strategic planning process also was announced during the speech. The new plan will guide the university from 2020, when the current plan expires, to 2025. The university’s growing research enterprise also was a theme of the speech. Research expenditures at the university are up nearly 30 percent over the past five years, and the institution recently earned the No. 1 ranking among American universities for driving new products to the marketplace. “Our innovation ecosystem is booming. A movement is already underway. This is our moment to accelerate, and we must seize it,” said Morehead. Morehead announced a multipronged initiative to further energize the campus around innovation, including a semester-long innovation fellows program to help faculty commercialize their ideas and inventions and a new extended orientation program to introduce incoming students to the university’s culture of innovation and entrepreneurship. Finally, he announced the continuation of two grant programs, one to promote interdisciplinary research partnerships around grand challenges and the other to enhance the academic experience of underrepresented, first-generation, rural, and other underserved students.